10 years ago an unknown band from Perth, Western Australia pooled their very limited resources and questionable facial hair, and got to work on their debut album. Recorded in various spaces, in various ways, with a slightly varying line-up, they borrowed gear, they borrowed money, they borrowed space and they used some tunings that perhaps haven’t been heard again. 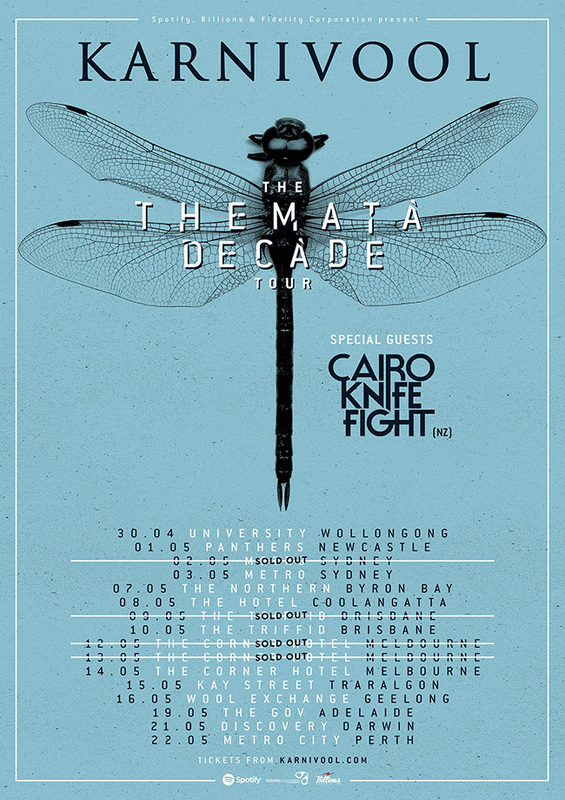 The band were Karnivool and the album that had so much blood, sweat, tears (and god knows what else) expended on it in those early hours was Themata. Karnivool are a band that usually only ever look forward. But, for once, they are going to take a look over their shoulders. The Themata Decade Tour: where longtime fans can go nuts to old faves, and new fans can hear some nuggets that don’t get shined often enough. Expect intimate, expect sweaty, expect loud. Expect to hear all of Themata - and more.